Today is the seventeenth day of Advent. Each day I will post a short blog aimed at kids that will help tell God’s story from the beginning to the birth of Jesus. And each day Meghan, my wife, will make a Christmas Tree ornament that helps us to remember the day’s Advent lesson. If you want to make them along with us all you will need is some felt, some glue, and some ribbon.I hope you will join us each day this Advent.You can catch up on any post you may have missed by clicking here. Do you know what I realised the other day? I am never in the quiet. When I am alone at work I listen to the radio. When I am at home with my family we have music on, or we are watching TV. When I go to bed I hear Asher’s sleep time music over the baby monitor (fun fact I have been listening to those same 12 ‘sleep songs’ since Simeon was born. At this point I think I am incapable of falling asleep without them). No matter that I am doing there is noise around me all the time. 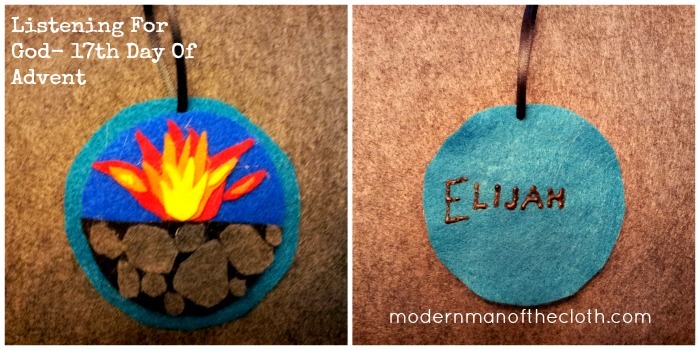 The story of Elijah is a pretty dramatic one. He challenges the people to test God and see if he is worth worshiping or not. God comes through and performs a miracle. The Queen was not happy about this and she tried to kill Elijah, but he ran away. After running away Elijah became really sad and hid in a cave. It turned out this was a pretty crazy cave. There was a wind storm, a earthquake, and a fire (I always imagine this as a volcano erupting). Noise, noise noise. The bible says God wasn’t in any of the noisy things. But after the noise ended God spoke in a still quiet voice. When God speaks we expect God to show up with a big, loud, and booming voice. But I think he speaks more often with a quiet voice. The question is can we find a quiet place to listen? Today on the seventeenth day of Advent we remember that we have to find a quite place to listen for God. This entry was posted in Advent 2013, Christmas, Faith, Family. Bookmark the permalink. Oh, I loved this one! Gave me goosebumps it was so beautiful. Thank you so much,I am glad these have been useful to you.